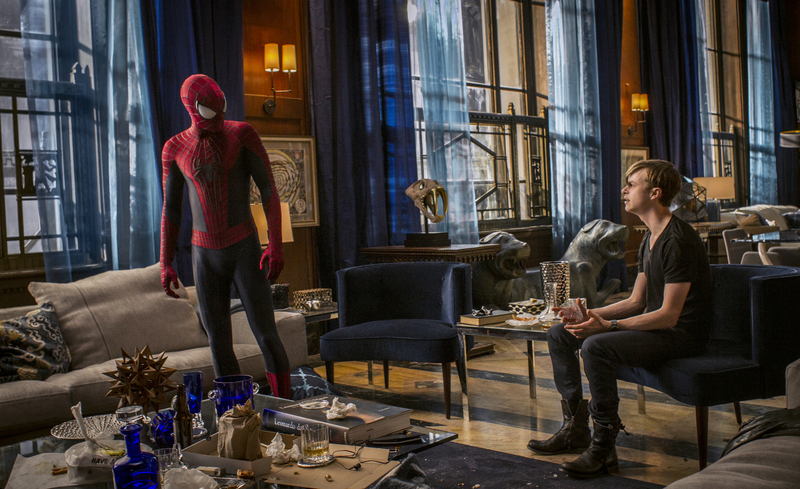 (l-r) Andrew Garfield and Dane DeHaan star in Columbia Pictures’ “The Amazing Spider-Man 2.” ©CTMG. CR: Niko Tavernise. “The Amazing Spider-Man,” 2012’s first installment of the webslinger’s rebooted film franchise, was more interesting, fun and faithful to the character than any of the three earlier films this century featuring the Marvel Comics mainstay. 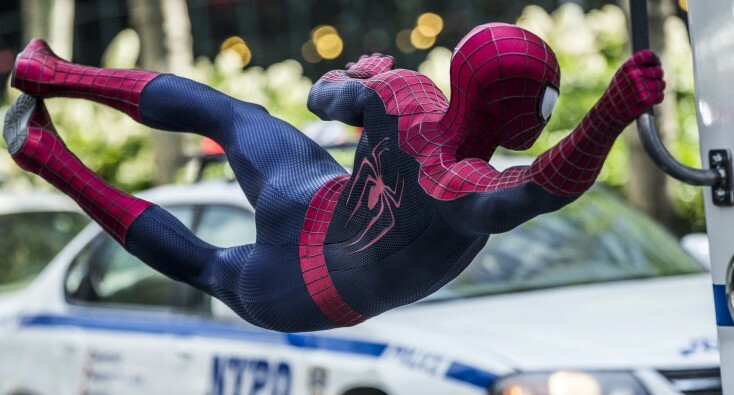 Although that set a high bar for this sequel, “The Amazing Spider-Man 2” manages to swing over it with style. Andrew Garfield is back as Peter Parker, who can do whatever a spider can (as they say) after being bitten by a genetically modified one. Unlike the hero of director Sam Raimi’s earlier trilogy, this one is more human in both senses of the term. He shoots the webs he uses to swing around New York’s skyscrapers from mechanical gizmos, as the comic book character does, instead of from freakishly mutated wrists, as the Raimi version did. Garfield’s Peter also is more believably conflicted and likably three-dimensional than Tobey Maguire’s slightly odder one in the Raimi trilogy. Emma Stone returns as valedictorian-brainy girlfriend Gwen Stacy, whose police captain dad died getting Peter as Spider-Man to promise he would stay away from her for her own safety. The speed with which Peter reneged on that deal was one of the sly pleasures of the last movie’s wrap-up, but now he’s seeing recriminating visions of Captain Stacy that convince him to do the right thing by cooling it with Gwen. Temporarily, anyhow. Flaws in the webbing this time out include the fact that both Garfield and Stone are far too old to play graduating high school seniors. A bigger problem is that the moderately powerful villain Electro from the comic’s early days has been amped up to become an almost “Avengers”-level adversary, instead of one that’s more appropriate for Spidey’s weight class. A bad guy who can absorb and blast back an entire city’s worth of electricity from his fingertips clearly outclasses a teenager whose best defense involves magnetizing his web shooters with a car battery. Jamie Foxx is a little too Christopher-Reeve-as-Clark-Kent corny as wimpy electrician Max Dillon, who transforms into an Electro that’s the sparking image of “Watchmen”‘s big blue Dr. Manhattan (except with pants). Dane DeHaan, eerily evoking a young Leonardo DiCaprio as always, is the mopey and then maliciously mad Harry Osborn, who gains control of dad’s rotten to the core Oscorp firm that has links to Electro, Gwen, the last movie’s villain The Lizard and Spidey himself. Director Marc Webb does an excellent job of making Spidey’s acrobatic mid-air swinging look so thrilling you’ll wish there was more of it. Action highlights include an early scene involving a hijacked truck, a whole lot of midtown car crashes and several hard-to-corral vials of plutonium. Webb also gets points for making a Marvel movie that doesn’t look or sound like most standard superhero fare. Shadows, rich colors and contrasts keep things from being too sterile, and the score by Hans Zimmer and “The Magnificent Six” (including members Junkie XL, Pharrell Williams and Johnny Marr) mostly avoids the generic. 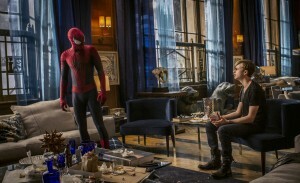 The satisfying screenplay by Alex Kurtzman, Roberto Orci and Jeff Pinkner includes new revelations about Peter’s mysterious parents, a plot that eventually ties together three villains without seeming too everything-into-the-pot about it, and lots of classic comic-book character touches, such as a stuffed-up Spidey foiling a robbery while buying cold medicine. Even though Electro has been excessively upgraded, a late scene goes way overboard with machine-gun mayhem and the movie takes some liberties with events from a landmark issue of the comics series, “The Amazing Spider-Man 2” succeeds at being a superhero flick that isn’t humorlessly grim (the “Dark Knight” trilogy), depressingly morose (“Man of Steel”) or a political thriller with costumes (“Captain America: The Winter Soldier”). The ringtone on Peter’s cell phone is the theme from the 1960s “Spider-Man” animated series, which says it all. The character’s trademark ups and downs from relationship problems and outside threats always will be with him. But it’s nice to see that there’s also excitement, nobility and joy in being a guy with abilities that are this amazing.